HelloPartnering is an online based conference and matchmaking platform that allows delegates to contact other participants and schedule meetings with them. 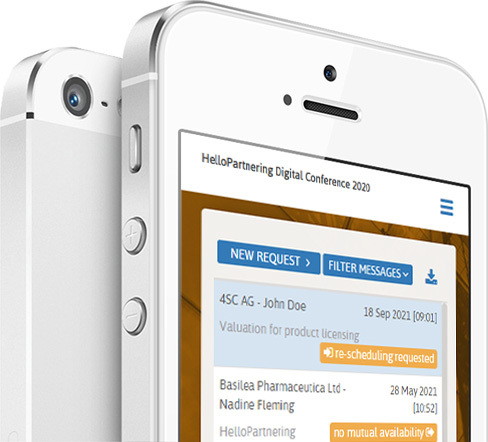 HelloPartnering is optimized for any screen size on any device. Are you looking for a cost effective premium partnering system for your conference? An integrated messenger allows participants to accept or decline requests and to communicate with other delegates. The user friendly interface has been designed in a similar manner to pre-existing communication and chat apps, for ease of use on either desktop or mobile devices. Specific needs or goals, advertise your need for investors, products to in-license or any specific type of client. HelloPartnering provides the only buyer / seller partnering software, creating a real market place. Through a direct link to the global life science database Biotechgate with 50,000 companies worldwide, company data can be imported from this source or a previous conference. With HelloPartnering you can start with completed company profiles of your participants. No more empty profiles. 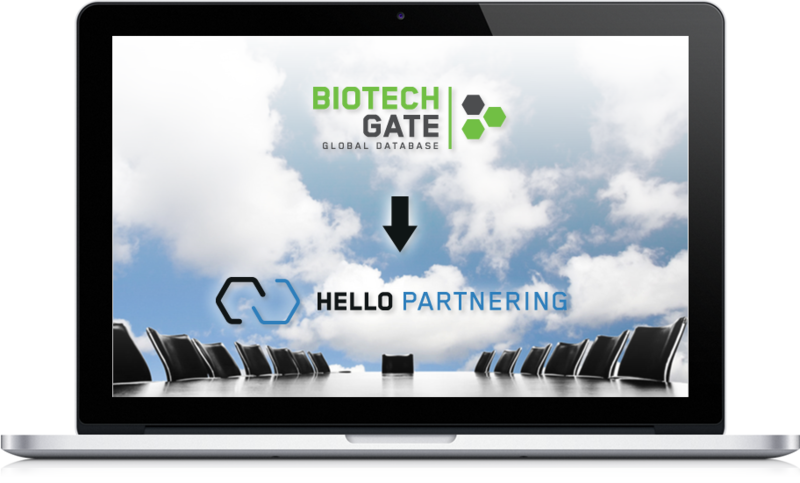 HelloPartnering is currently optimized for life sciences conferences but can be easily adapted to any industry. 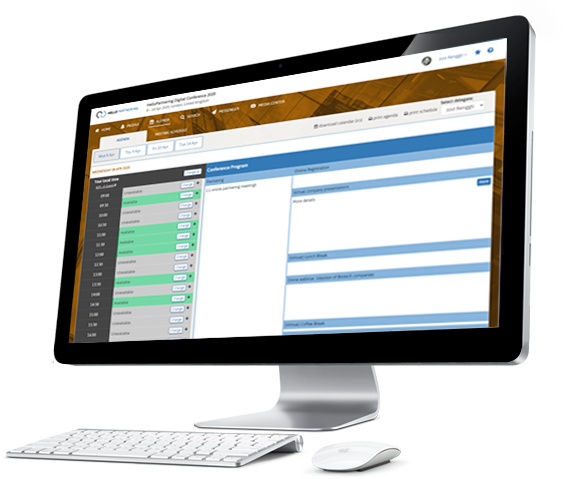 The system provides simple, yet powerful search capabilities to filter for relevant companies, products, services, technologies and delegates. 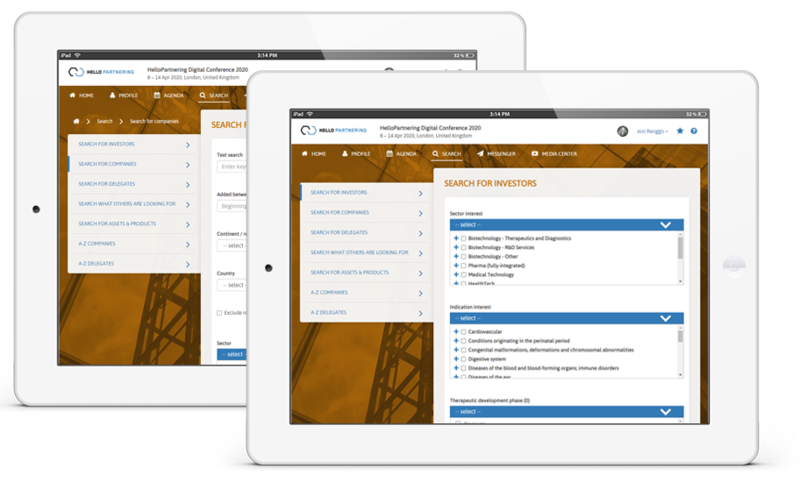 Based on defined conference goals made by a delegate, HelloPartnering makes recommendations for search features to use and companies to contact. HelloPartnering integrates the delegate's agenda and the conference program on one page. This makes it easy for participants to keep the overview on all relevant dates and to define their availability. HelloPartnering even supports multiple conference programs, letting the user run multiple different conference topics, all within a single event. This makes it possible for delegates of different conferences to interact and schedule meetings with each other. HelloPartnering is a product of Swiss based Venture Valuation. We have over 12 years of experience with conference and partnering platforms used at numerous international conferences every year with thousands of participants. The architecture and ontology of the partnering system has been based on our global Biotechgate database. Please visit the websites of Venture Valuation and Biotechgate or contact us to learn more, get a quote or demo. Please give us a call or fill out our contact form. We will respond to you shortly.